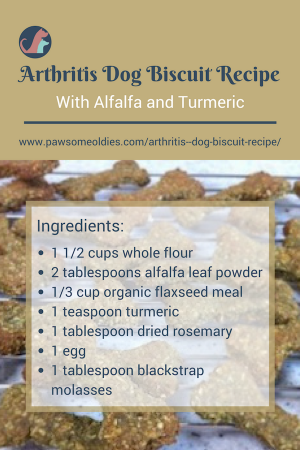 This arthritis dog biscuit recipe is especially designed to make a healthy treat for older dogs with joint pain due to arthritis or other inflammatory joint diseases. 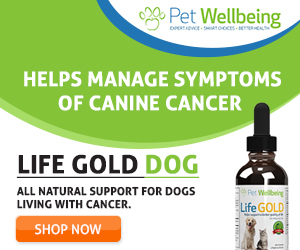 All the ingredients are safe and healthy for dogs and beneficial to joint health. This arthritis dog biscuit recipe is low in fat, high in dietary fiber, vitamin B6, and iron. 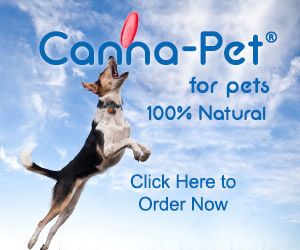 So even if your dog doesn’t have joint pain, it is still a healthy treat! Alfalfa has a “grassy” taste but many dogs seem to have no problem eating it. My old dog Hana loved the taste and always begged for more! Alfalfa is an herb that has a lot of health benefits (see below). One way of incorporating the herb in your dog’s diet is to use it in homemade dog biscuits like this one! Alfalfa is a very nutritious herb. It contains high levels of protein, fiber, trace minerals, and vitamins A, B1, B12, C, D, E and K! Since it is rich in chlorophyll, it is also a powerful antioxidant. Because of its antioxidant and anti-inflammatory properties, it is one of the best herbs for arthritis and joint diseases. Also, because of the above 2 properties, alfalfa is believed to have anti-cancer functions. In addition, if your oldie has a poor appetite due to sluggish digestion, alfalfa can help due to its trace minerals and rich digestive enzymes. Old dogs with a poor blood circulation can also benefit from alfalfa. This herb is actually commonly used as a blood tonic. Dogs with a poor circulation usually have poor skin condition such as dry skin – this happens quite often to older dogs. So keep this herb in mind next time you notice poor skin condition in your oldie! As you can see, alfalfa is a very beneficial herb for dogs, especially older dogs. Turmeric has recently been hailed as a “wonder herb” for its powerful antioxidant, anti-inflammatory, and anti-cancer properties. Because it is anti-inflammatory, dogs with inflammatory joint diseases can benefit from this herb. Rosemary is another herb that can help older dogs. It has anti-inflammatory, anti-oxidative, and anti-cancer properties. It can relieve pain, is anti-bacterial, and can boost immunity, boost memory and enhance cognitive functions. All good for our pawsome oldies! Flax is rich in Omega-3 fatty acids, which have anti-inflammatory and antioxidant properties. Omega-3 FAs have been found to be essential for joint health. 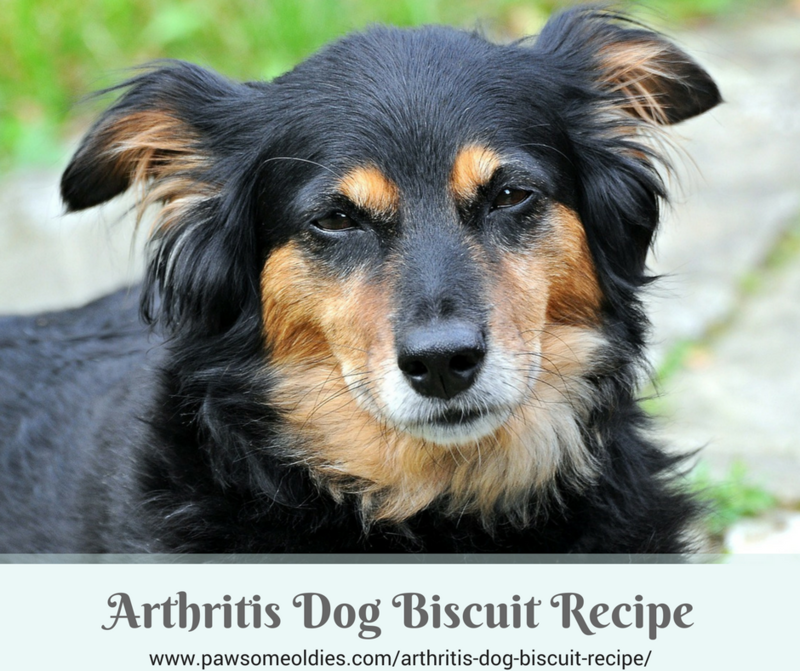 OK… With all the fabulous ingredients that are good for old dogs, I think you will most likely agree with me that this arthritis dog biscuit recipe is a keeper, right? And yes – it is extremely easy to make and your dog will most definitely give his/her four paws up! Add the egg and blackstrap molasses to the dry ingredients and mix well. If the dough is too dry, add water, a teaspoon at a time, until the dough comes together. Knead the dough a few times and let it sit at room temperature for about 15 minutes. Transfer biscuits to the baking sheet and bake in preheated oven for 20-25 minutes. To harden the biscuits more, leave them in the oven until cool. Remember to store your ground flaxseed in the refrigerator as it can go rancid very quickly. Blackstrap molasses can be replaced by organic local honey.